2105.01.01 Just after the new year, the Olympian Republic’s first frigate, Andromeda, is commissioned to great fanfare. 2105.09.23 Savage Exports apparently did not get the hint. 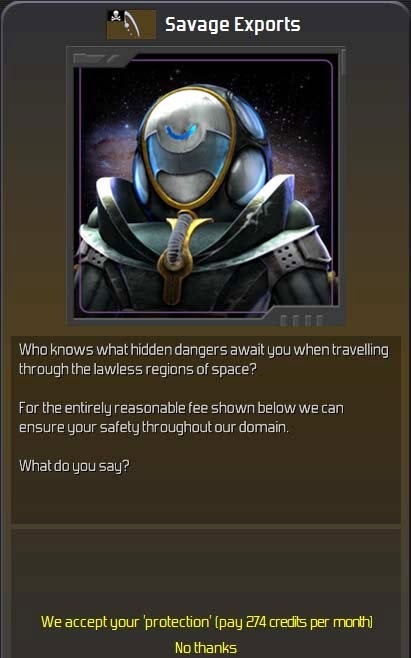 They make another “protection” offer, for a higher fee! The offer was rejected last time, with no consequences. 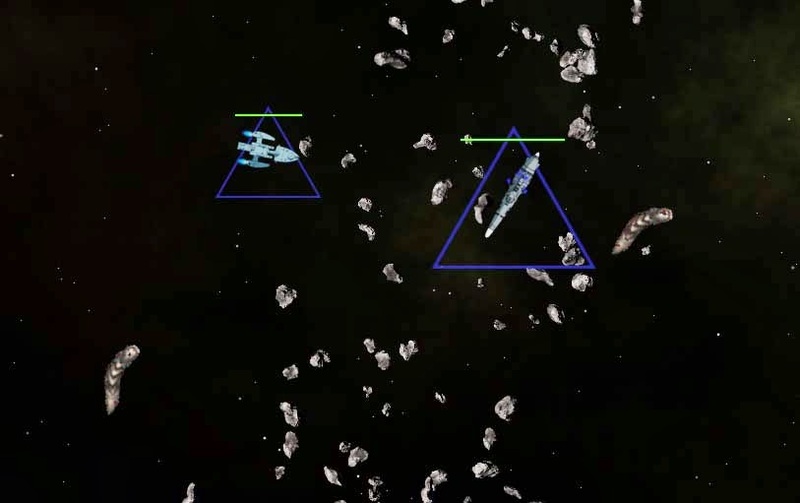 The Senate sees no reason to accept this time, especially with Andromeda and the two corvettes ready and waiting to destroy anyone foolish enough to attack. 2106.01.01 Several quiet months go by, and the Ancient Monolith of Sol Lounge Resort is completed. Soon after the first Passenger Liner, Foolish Partisan begins construction. 2106.10.01 Savage Exports return again. What are they protecting against? Nothing, apparently. The Senate sends them packing. 2107.10.13 Savage Exports offer a protection agreement again. Fools. 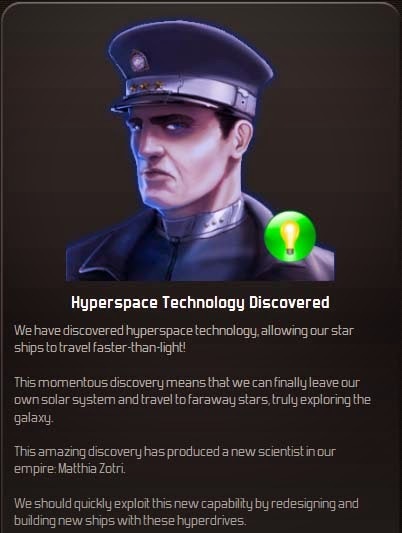 2107.10.17 A momentous day has arrived, as hyperdrive technology has become a reality. 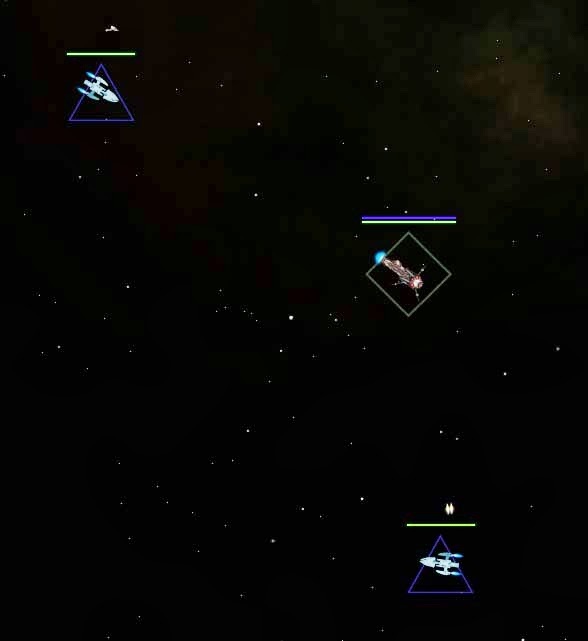 Quickly new ship designs are implemented, and exploration can truly begin. 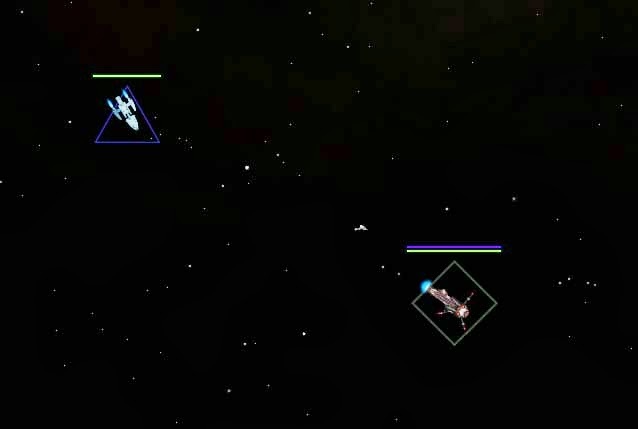 The two corvettes are sent to retrofit, as is the frigate, however the maximum size that the Olympia Space Port can handle is a mere 160, and so the frigate loses some armor and two Maxos Blasters in order to fit a hyperdrive and a Basic Proximity Sensor. All of this activity promptly overwhelms Olympia Space Port’s construction capacity. 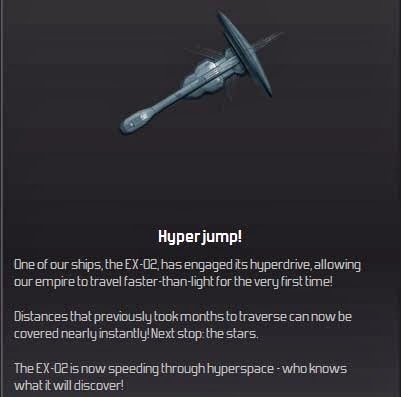 The newly constructed Exploration Vessel EX-02 executes the first hyperjump. And now all three new vessels are off to the stars. 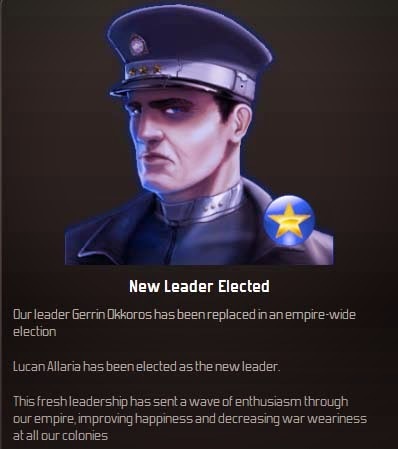 2108.03.19 There is an election, and President Okkuros is succeeded by President Lucan Allaria. 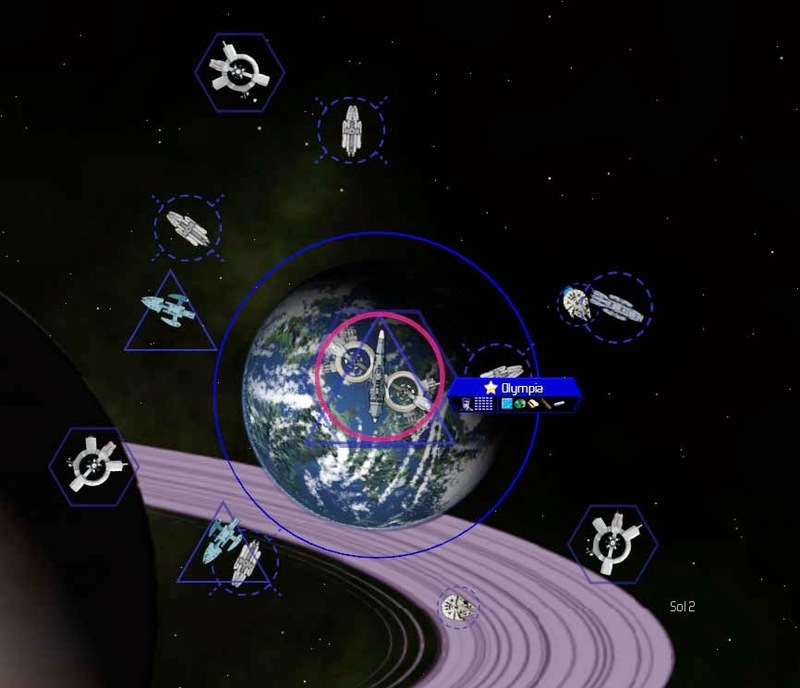 2108.04.07 Now with hyperdrives, the Olympian Navy decides to conduct a fleet exercise and eliminate some space slugs. The slugs are killed, but Andromeda wanders a little too close and suffers some damage to its armor. It returns to Olympia Space Port to get repairs. 2108.10.21 Savage Exports offer yet another protection agreement. Nope. 2108.12.16 EX-02 arrives in the Mu Mensae system, and discovers a mining station owned by pirate mercenaries, the Burning Claw Marauders. They “generously” offer to provide information as to the whereabouts of an independent colony, but the offer is rejected. 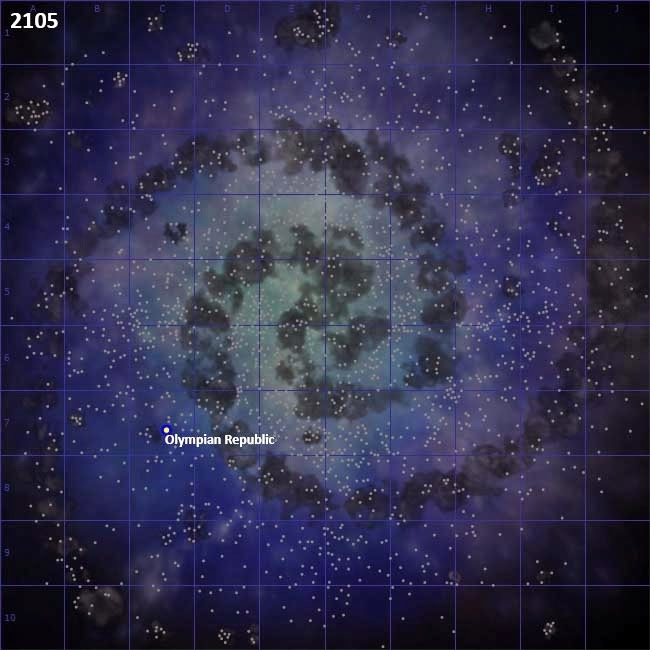 Olympia has hyperdrives, and can find these colonies on its own. 2109.01.01 By the end of the year, two systems are explored, the Tau Pavonis system and the Mu Mensae system. 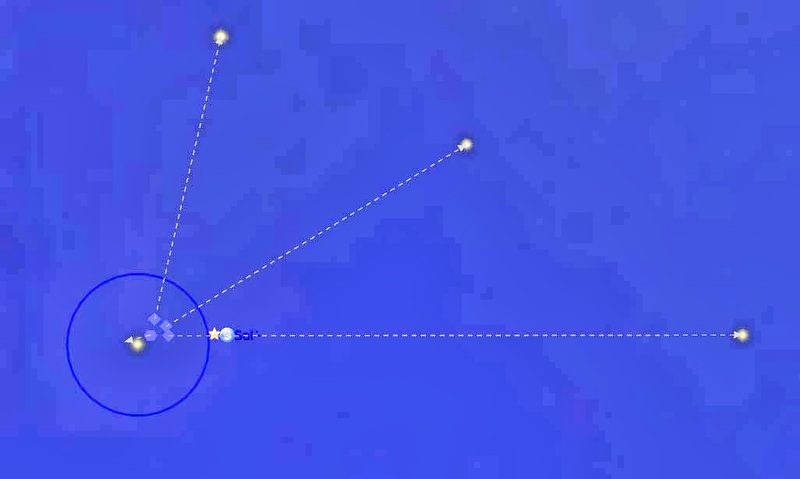 Neither has any colonies, but the Mu Mensae system has a gas giant which could assist Weapons Research. Cataloged and marked for future study. 2109.09.23 Quiet months go by as the Explorers continue their slow progress to the stars. Despite the rumors of pirates, none have every been seen, and other rumors persist that pirates don’t actually exist. The Navy ship captains are so excited at the arrival of a pirate exploration vessel in the system, that they fight over who has the right to the kill. On account of being closest, Inazuma arrives first. But Ikazuchi shows up second, cutting off the pirate and getting off the first shot. Both captains start yelling at each other over the comm system, each asserting his right to the pirate, and while they argue, the pirate escapes before Ikazuchi’s missiles even reach their target. How disappointing. 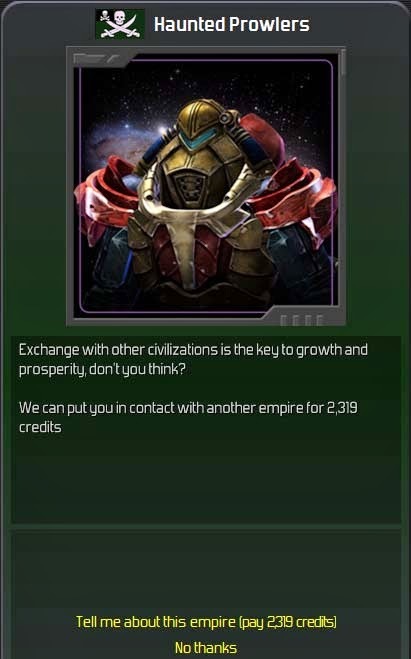 2109.10.28 Savage Exports offer another protection agreement (rejected) and offer research in Advanced Nuclear Fission (which is nearly done researching) for the bargain price of 80,000 credits (rejected). 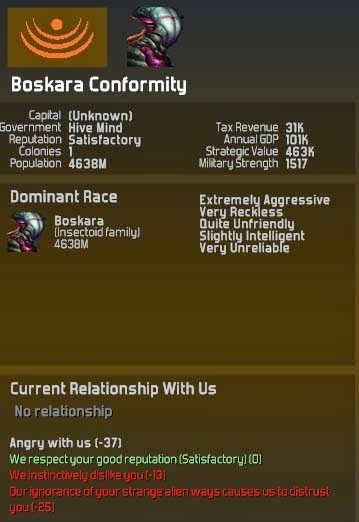 Savage Exports just wants to be loved (denied). 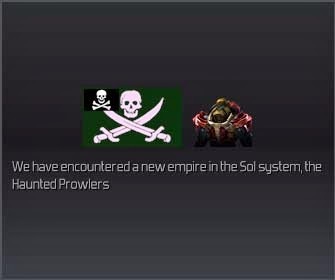 The Haunted Prowlers, despite the ineffective attack on its exploration vessel, offers contact with another alien race. They will only charge 2,319 credits, which, all things considered, is not much. While the military squabbles over how gruesomely they should kill the messenger, the diplomats say “This one’s ours,” and accept the offer. Eew. Bugs. It is hoped that these guys live far, far away. They’re ugly and none too friendly, either.